What are the top rivalry games in football? There are some things in this world that define necessity. Joe Montana needed Jerry Rice, Cory needed Topanga and Michigan needs Ohio State like Auburn needs Alabama. Every football season our office has the same arguments about which are the biggest rivalry games in football. 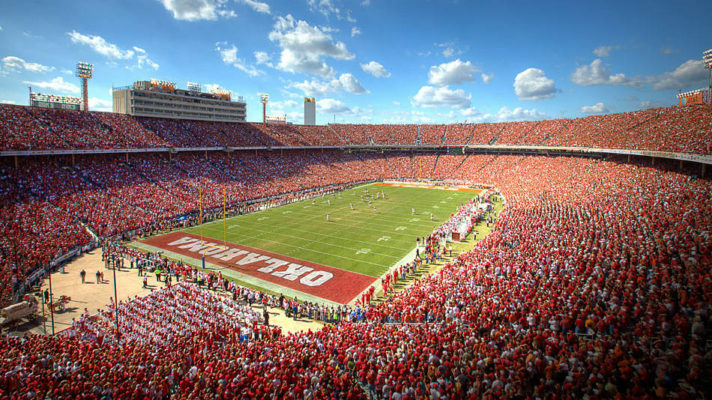 Is Texas/OU bigger than the Iron Bowl? Or is Ohio State vs Michigan the biggest. Is the Cowboys vs Eagles a bigger rivalry game than Patriots vs Steelers? Would you rather attend the World’s Largest Outdoor Cocktail Party or the Civil War? We have same arguments and usually people have the same opinions that they had in the past. This year, we decided the solution was to get the opinions of some of football’s brightest minds. We reached out to a handful of our partners and got their picks for what are the biggest rivalry games in the NFL and college football. Check out the list below and let us know what you think are the biggest rivalry games in football. When you think of NFL rivalries, this one tops the list. The Chiefs and Raiders have a feud dating back as far as the NFL-AFL merger and the fans do a great job keeping the blood flowing every year when the two teams travel to each other’s home. Santa might get booed, players might fight on the midfield logo, or complete chaos might break out when these two teams play. The Eagles hate the Cowboys and the Cowboys hate the Eagles. This feud has even spilled over off the field with owners Jerry Jones and Jeffrey Lurie taking opposing sides on the National Anthem debate. The Packers and Vikings go way back, but this rivalry heated up when Brett Favre manipulated his way to the Vikings after “retiring”. The rivalry should be even hotter now that the Vikings won the NFC North in 2017 and have a loaded young roster. This might not be the hottest rivalry in the past, but the addition of Sean McVay (Rams) and Kyle Shanahan (49ers) to the NFC West will make this a battle to watch for years to come. When these teams meet, there’s going to be a lot of bad blood and a lot of personal fouls. The Ravens and Steelers both feature tough tacklers and the types of attitudes that contributes well to keeping a rivalry going for the last decade. The rivalry that has defined the Big 12 for the last 20 years. Without this game, the league doesn’t even exist. Over the last decade, it’s as if Bobby and Peter Brady have been fighting to replace Greg as the top Brady brother because he Greg became a stoner and dropped out of school in an effort to be Johnny Bravo. I’m sorry if that went over your head. I’m old. Don’t anyone tell a Longhorn that the Red Raiders are rival because they’ll dismiss the idea quickly, but these two teams have played some incredibly meaningful games against each other for the last two decades. Plus, there’s a little bit of true bitterness and hatred in the mix as well (see 1998 when Derek Dorris took out Anthony Hicks’ knee). As someone that used to date a Jayhawk and fully understands the bitterness involved, trust me when I tell you that the hate is real. In fact, in terms of pure hatred, this probably needs to be higher on the list. If we’re considering all sports outside of football, this is easily No.3. The Iron Bowl features two in-state rival fanbases that hate each other. Throw in regular championship implications and you’ve got one of the best rivalries in all of sports. These rivals have been playing since before 1900 and are still battling for championships as evidenced by last year’s season. While the Egg Bowl might not get the attention nationally that the Iron Bowl gets, in the state of Mississippi, it’s bigger than ever. The two SEC East rivals play each year in Jacksonville, and the matchup can often dictate how the SEC East unfolds. While the Nick Saban era has made this rivalry pretty one-sided, the Third Saturday of October remains an important SEC rivalry with 100 years of tradition behind it. It’s old school, but it’s still a big-name showdown. It’s the annual battle for the Atlantic – including last year – meaning it’s the annual battle for the ACC title. It’s not just for basketball anymore. Out of all of the North Carolina schools in the ACC, this rivalry might be the nastiest. Virginia still needs to grow into a football power again, but this game is a huge deal. One or both of these teams has been ranked during their meeting, so there’s a lot on the line when these Pac 12 North rivals clash. This traditional rivalry has been fantastic recently, split the last 4 years, and each has been an exciting high scoring affair. A close game through 3 quarters last year, this is a rivalry on the rise. Especially with 2 potential Heisman candidate quarterbacks in this year’s game. The Apple Cup has seen some lopsided affairs, but the game will always be interesting as long as Mike Leach is giving press conferences for the Cougars. The Rumble in the Rockies is usually very streaky, with one team using holding dominance for 5 or more meetings in a row. This matchup has intensified since both joined the Pac 12 and is split the last two meetings. It’s still the biggest rivalry in all of American sports. It’s still the most important game on the Big Ten schedule. The Ohio State game is bigger for the Wolverines, but this one is a whole lot nastier. It’s been a painfully one-sided rivalry over the last several years, but the battle for the Paul Bunyan Axe is always a huge deal. Usually a battle for pride, or with one team desperately needing a win for bowl eligibility, the battle for the Old Oaken Bucket always matters. They play for a pig. It might not matter on a national scale like Michigan State vs. Ohio State or Penn State playing any of the big boys, but the fight for the Floyd of Rosedale trophy is always intense.